I just don’t get this business about having to raise rates at the Fed, and now how it’s all like: hmmm, this China/markets thing may force us to push out the liftoff…but, as per Bill Dudley, president of the NY Fed, “I really do hope we can raise interest rates this year.” (H/t: Matt Yglesias). 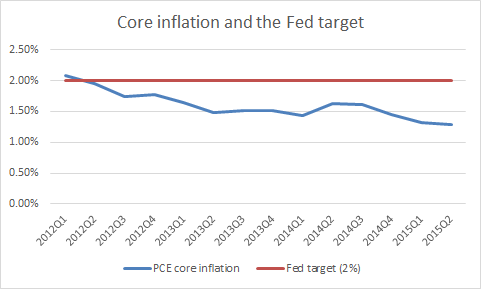 Here’s a picture of year-to-year inflation using the Fed’s preferred measure–the core PCE–including this morning’s revised GDP for 2015Q2. The other line is the Fed’s 2% target, which they’re not just missing…they’re increasingly missing. It seems additionally odd that there’s now quite a resounding chorus of economists from various parts of spectrum scratching their heads about this craze to raise. Since Bernanke, the Fed has made venerable efforts to explains its thinking. Maybe I’m not listening close enough, but I’m pretty much hearing crickets on this one…whassup Janet, Stan, et al? Share the post "The craze to raise"